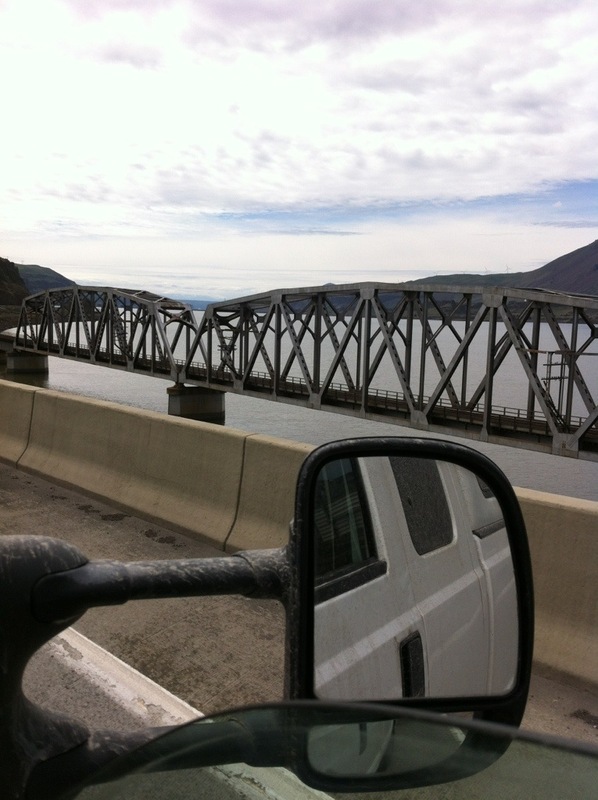 The Department of Transportation (DOT) frowns upon equipment being in disrepair. 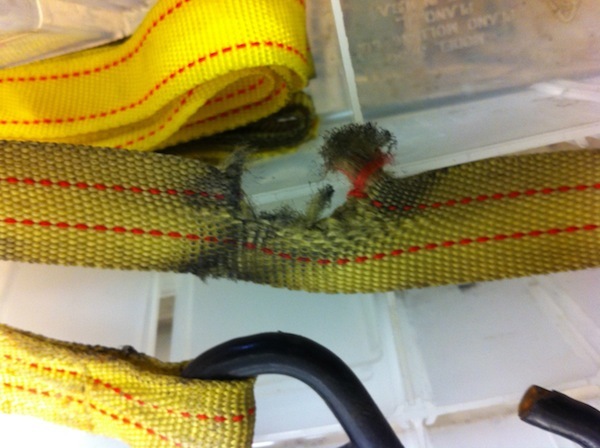 Faulty equipment is only an accident waiting for a place to happen. Joe and I do our best to keep our stuff in good repair, but sometimes there is just nothing we can do. 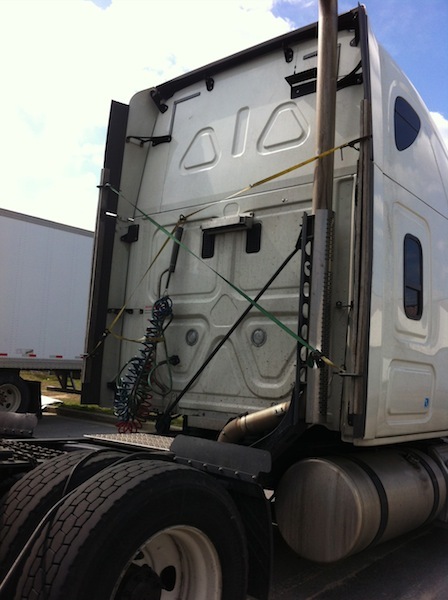 When a ratchet strap goes bad on the road – breaks or tears – we end up purchasing new and putting the broken pieces aside for later when we get home to fix them. 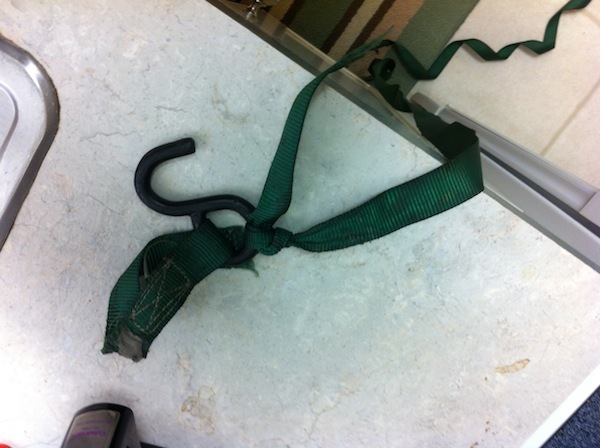 Usually it is the webbed straps that fail and not the ratchet. Although the ratchets do fail from time to time. Especially when we opt for the cheap stuff from Harbor Freight or some other discount tool place. The storage compartment on the trailer that holds our straps has become a nightmare to get in. Crammed full of old red rags, hand wipes, spare straps, and a bunch of other stuff I have no clue why it is crammed in the box. 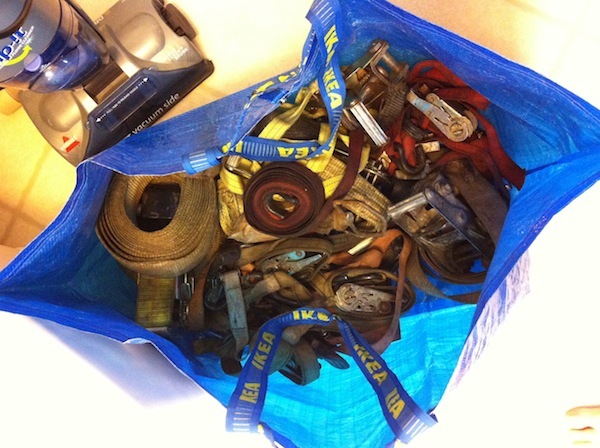 So my job today is to sort through all the straps. 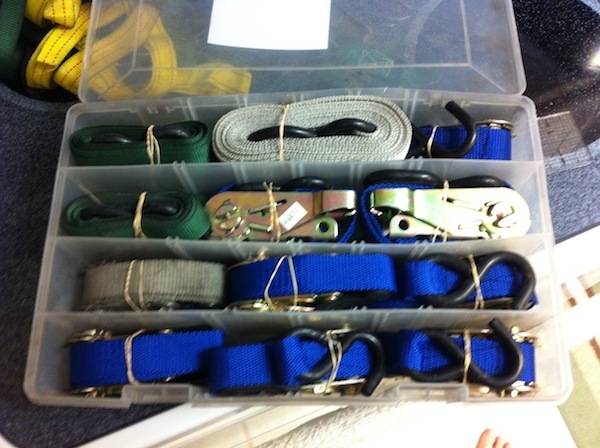 Let me tell you, there is a plethora of straps and I’m flabbergasted by the sheer volume of them. Some have broken and were tied together in a last ditch effort to make it work. This is a BIG NO-NO! One has been rubbed against something and is not long before it, too, will have gotten the “tie it up” treatment. One is beginning to show the wear. The tears on this strap are bad enough. 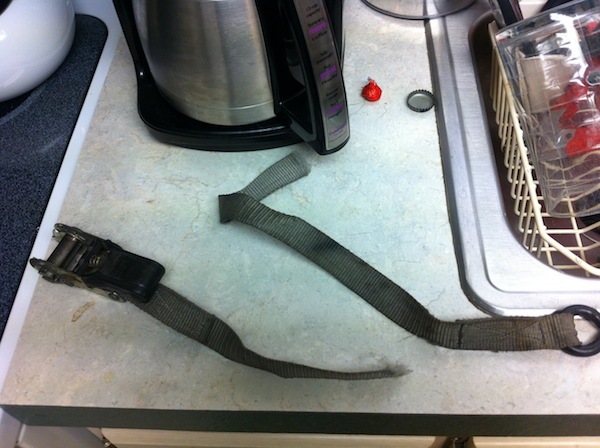 If a DOT Officer were to see this strap in use I would get a violation and have to replace it. I don’t want to be hassled by “the man”. 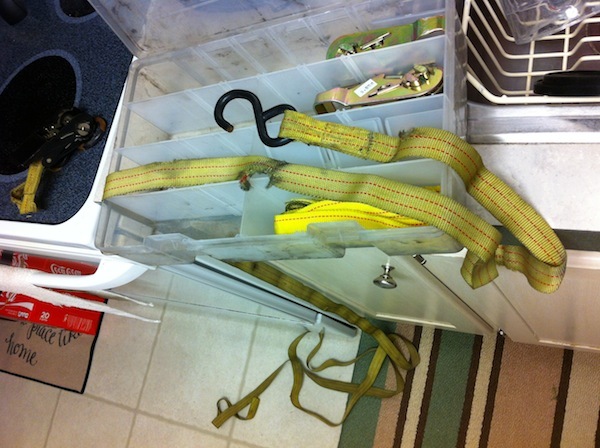 One ratchet strap had broken apart and got itself tangled up in the mess of straps in the box, and in the bag. 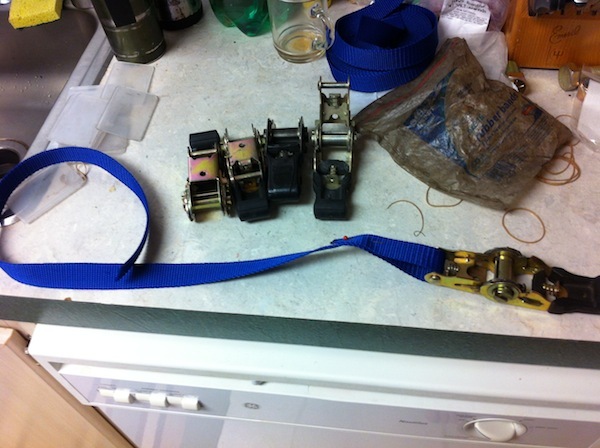 Our most recent strap purchase, to replace the worn and torn ones, had ratchet pieces that are very short. 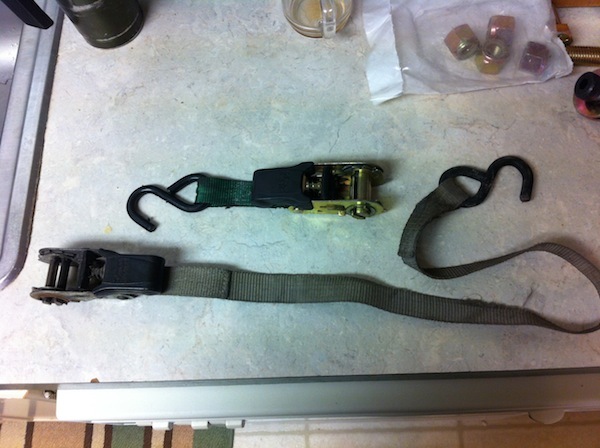 I need to extend the strap for easier use, as shown in the longer one I had altered about 5 years ago. 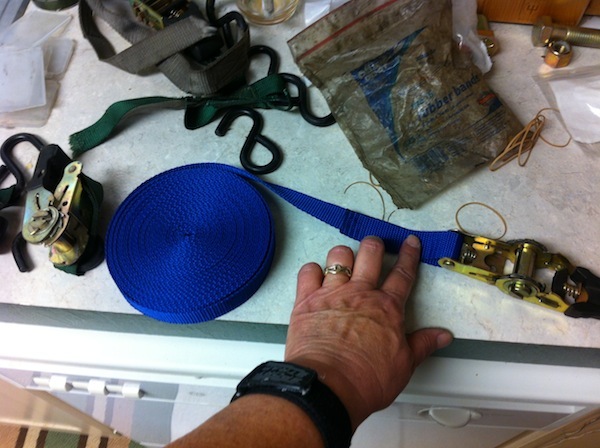 What you will need to repair old straps. You will need some webbing material. This can be purchased at fabric stores. I purchased ours in Wichita, Kansas at the “Yard Store” which has a ton of military surplus stuff. 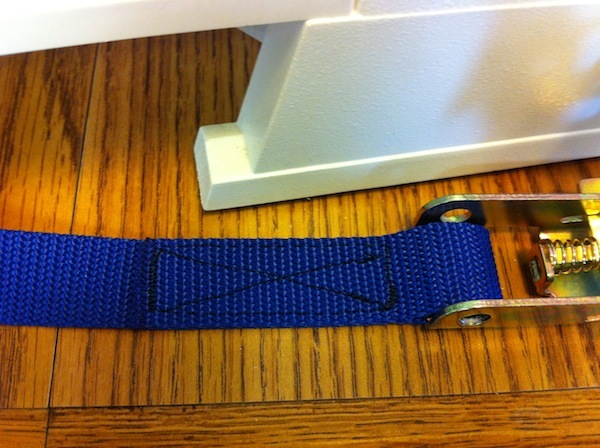 I’ve looked at the online site and they don’t have a category for this strap webbing. You may have to call them or stop by and have a look around. 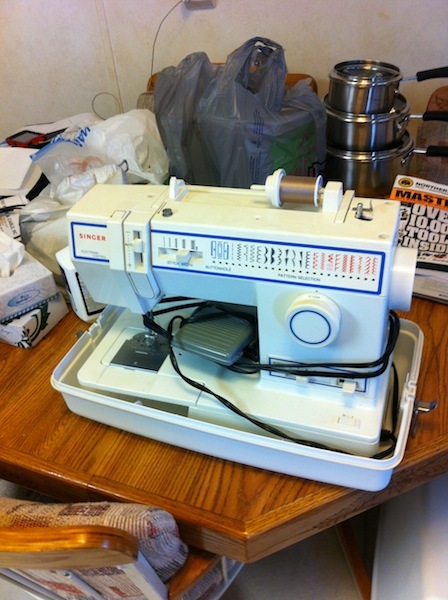 You will need a sewing machine. This stuff is pretty tough to work with by hand sewing. 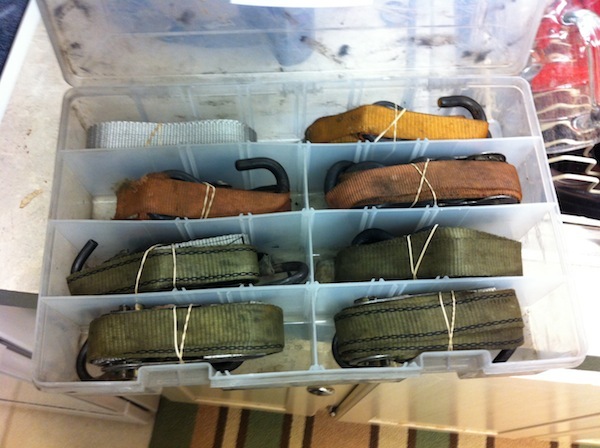 Joe took two 2″ straps to a shoe repair shop to have them sewn and he was charged $60. I couldn’t believe the exorbitant charge! Sewing machine needles meant for heavy duty fabrics. I’ve purchased some that are for denim and they work just fine. These I got from my local fabric shop. 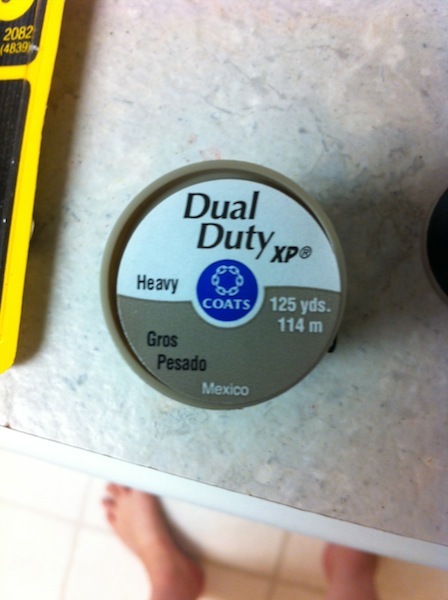 Thread that is marked for “Heavy Duty” or just “Heavy”. 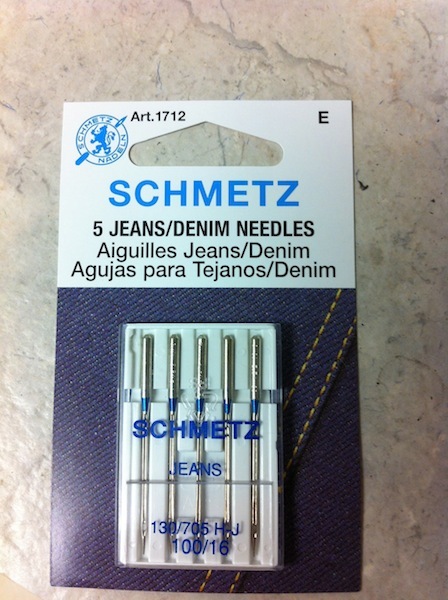 This thread is used to sew through denim seams. 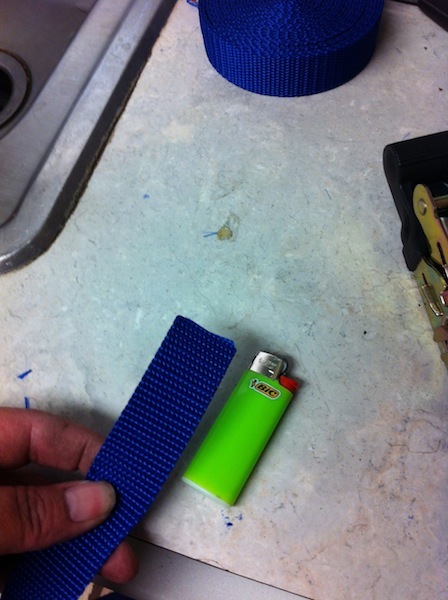 And, finally, a lighter to burn the cut edges of the webbing to keep it from fraying. I have four ratchets that need longer strapping. 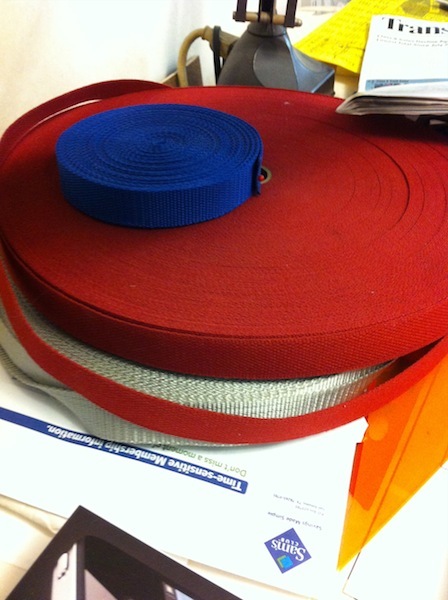 Take a strap with you to the fabric store or military surplus center. 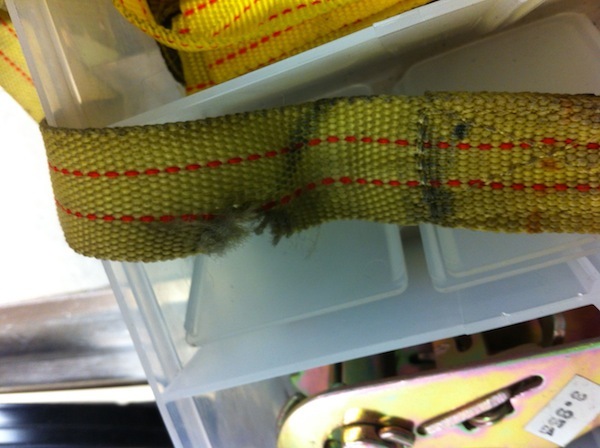 Make sure the new webbing will fit through your strap mechanism before you purchase it and get home with it. Since I’ve done this a few times before I know the stuff I have will work. Cut the strapping to the length you will need. I’ve cut five pieces to a length of 29″. 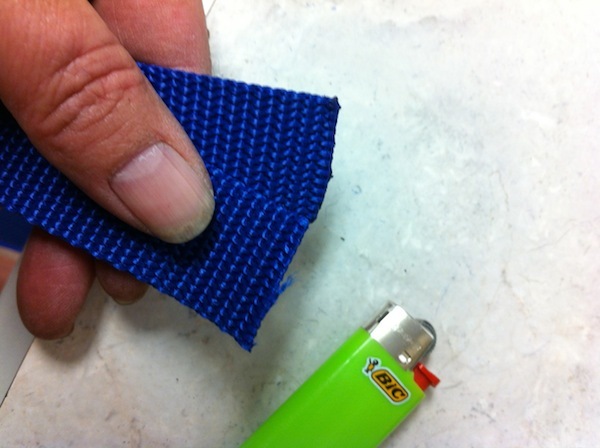 With your lighter, burn the cut edges of the strapping to melt the fibers and close them off from fraying. 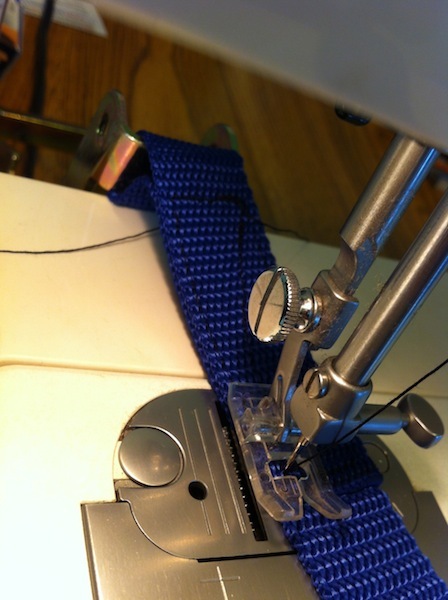 Run the strapping through the pin on the ratchet and give yourself a good 3 to 4 inches to sew down. 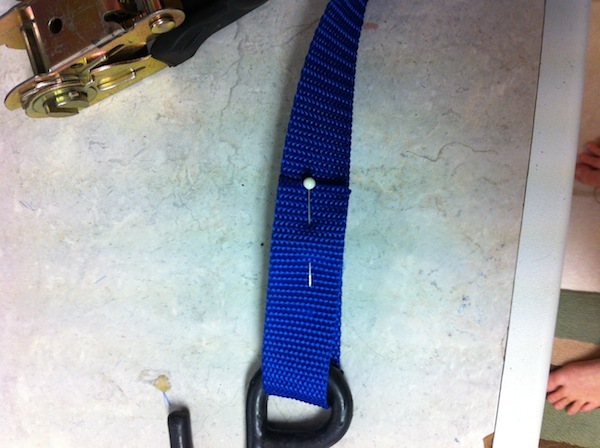 Run the other end of the strap through the eye-hole of the hook, leaving a length of 3 to 4 inches to sew on. 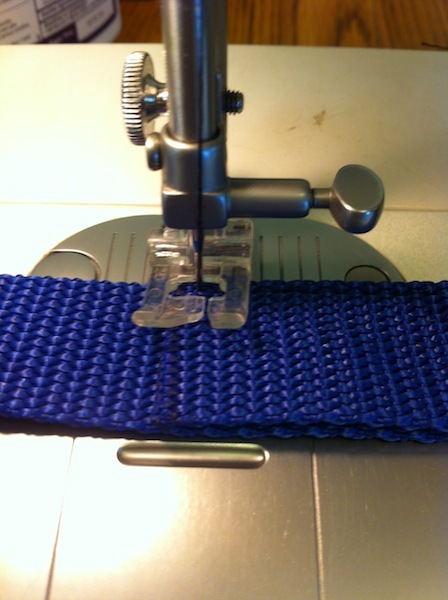 Using a straight stitch on your sewing machine, set the webbing under the pressure plate, then sew across the width of the strapping near the ratchet. 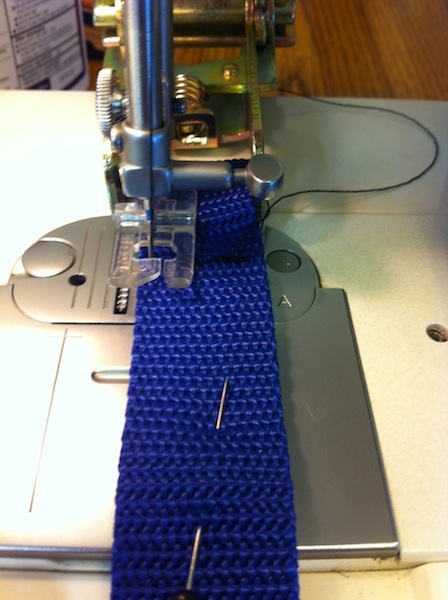 Don’t get too close to the ratchet or you will have a bugger of a time rounding the corner to sew the length. 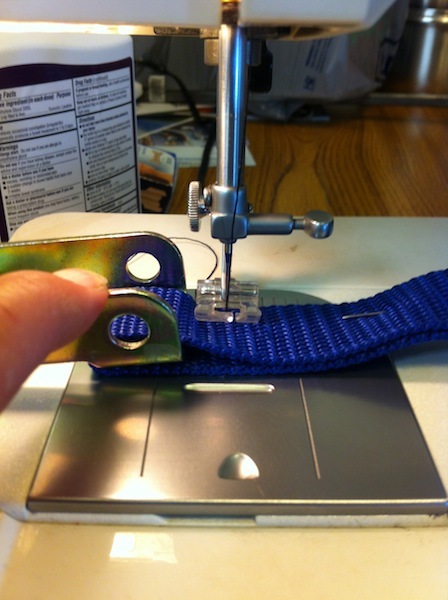 Sew down the length of the strap and stop near the bottom edge of the cut piece. 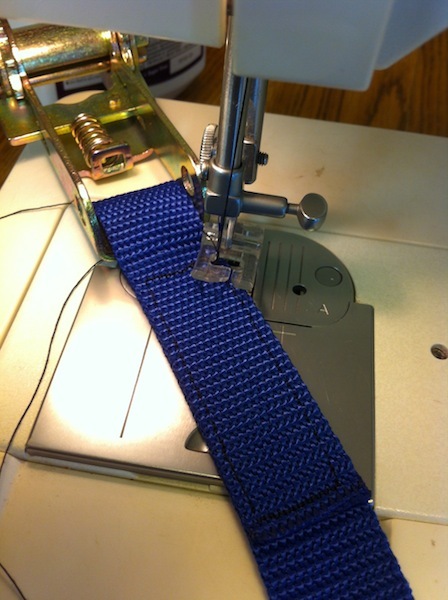 Sew across the width of the strap near the cut edge. 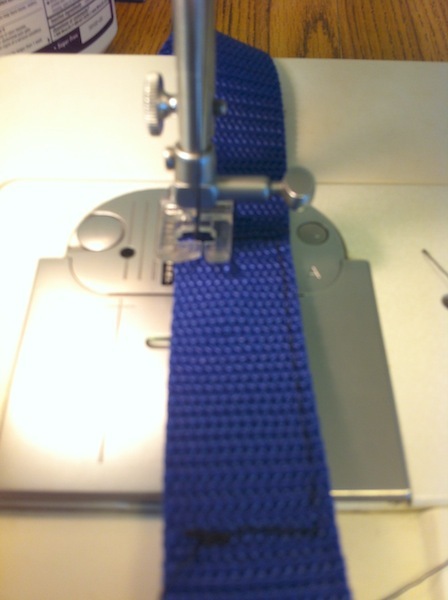 Sew up the length to where you began the stitching. 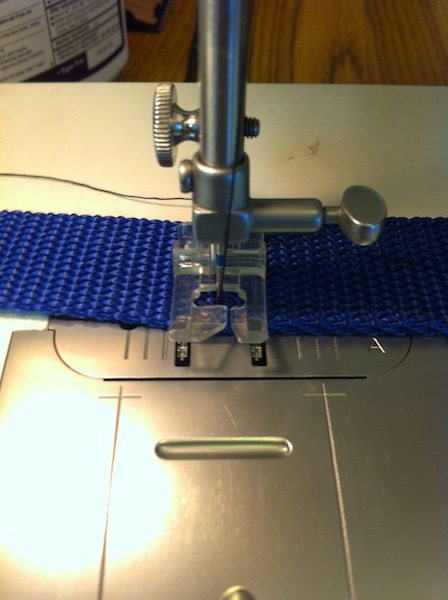 You will need to make a reinforcing stitch by creating a “X” in the area you have just sewn. 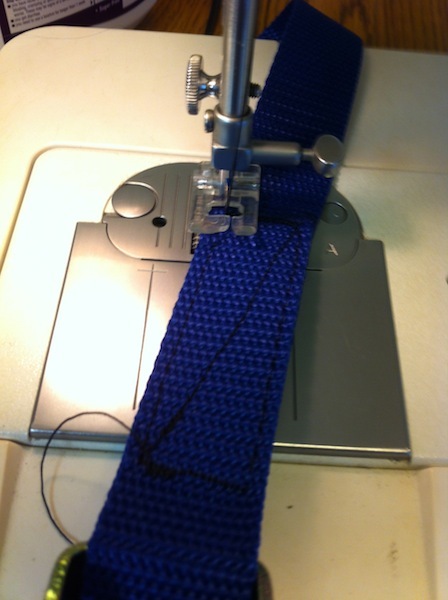 When you are at the top of your first stitching line, that goes across, turn your strapping roughly diagonal. You won’t get a “PERFECT” “X” but it will work just fine. Sew across the cut edge, once again, to get to the other side and make the other part of the “X”. Now sew the other leg of the “X” to complete the reinforcing stitching. 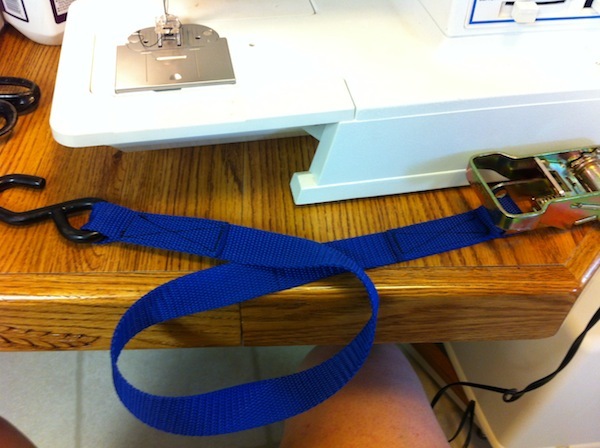 Now do the very same process with the HOOK end of the strap. 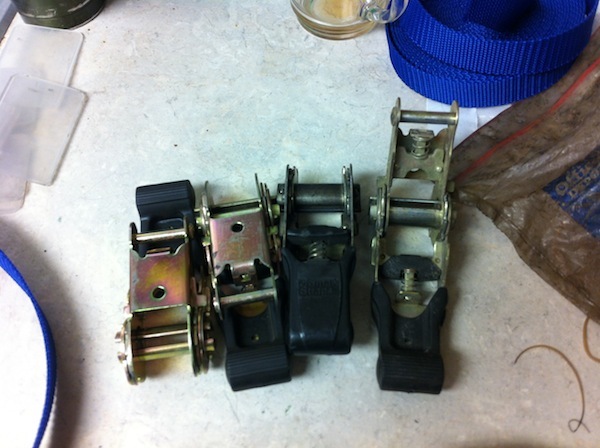 I now have my straps repaired and ready for work. 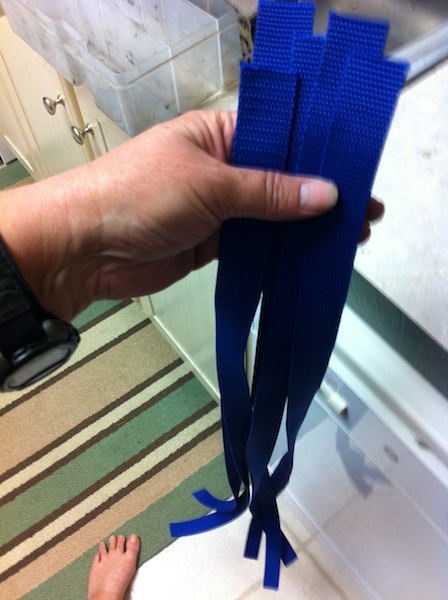 Tie them up with rubber bands to keep them from coming undone. One box for the fairing straps and one box for the steering wheel straps. This makes me feel good. All nice and neat. 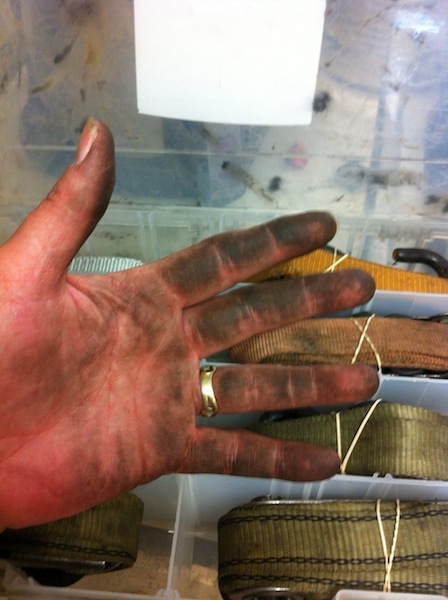 Steering wheel straps extended and repaired. This is where the steering wheel straps go. All that is left is to take the boxes to the storage box on the trailer and to wash my filthy hands! I’m just about ready to get back to work. Next, I’ll have to cut off some scrub pants for Joe so he has scrub shorts to wear during hooking up. Safety barriers as art pieces. 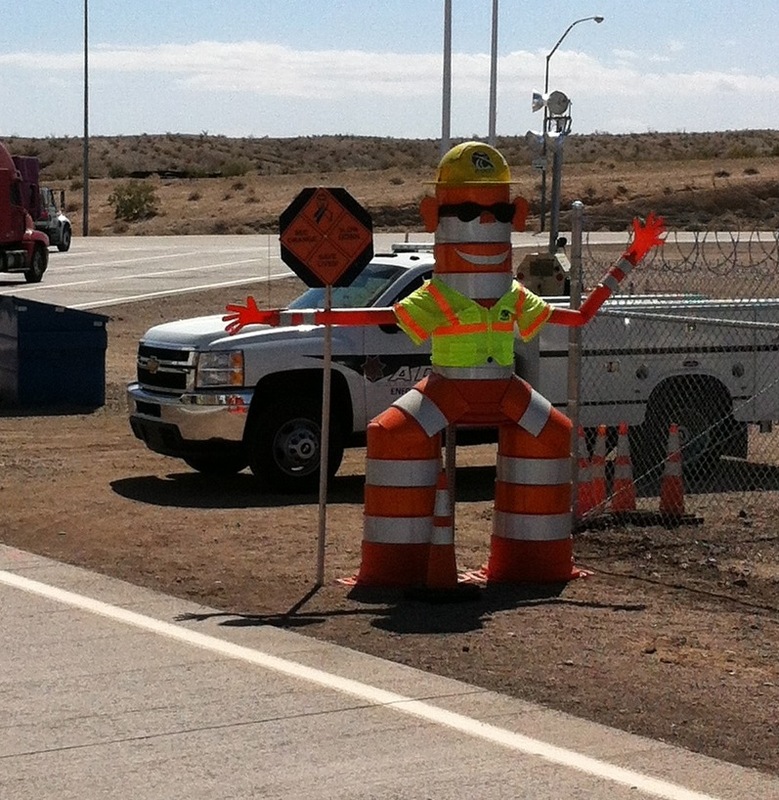 You can’t seem to escape the road work! City streets torn up to replace water or sewer lines, or just fixing an old section of the streets. Highways and state roads always seem to be under construction in one form or another. New bridges, texturing old pavement to make it ready for a new layer of asphalt, entire stretches of road demolished and being readied for new concrete and asphalt roads. There always seems to be some sort of road work being done on a daily basis. Makes these big trucks find a place to hole up. 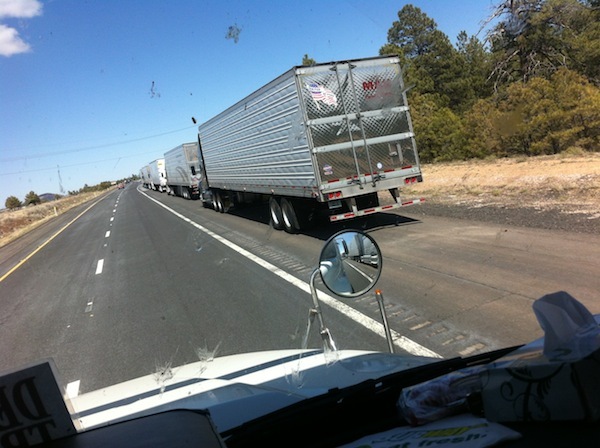 About 15 miles west of Flagstaff we saw trucks parked on the shoulder of the roads and both sides of the highway on ramps. 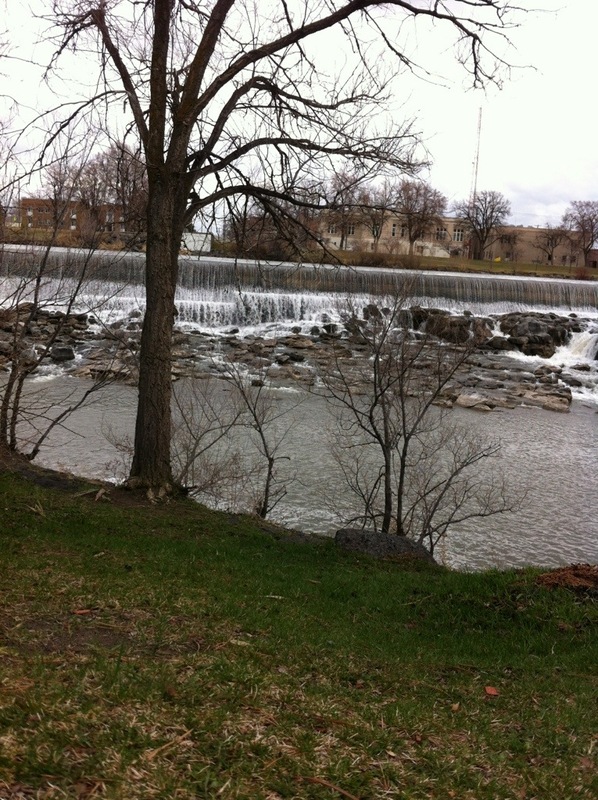 This was April 16th around 1 p.m. 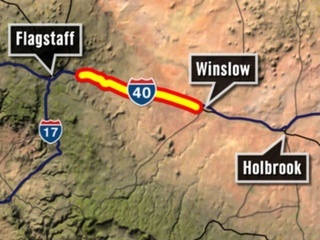 The highway was going to be shut down until 7 p.m. to all traffic going east and west on I-40. The winds and blowing dust were so bad that visibility was less than 1/4 mile. Joe and I decided to call it a day in Flagstaff and wait it out until the next day. We had picked up trucks in French Camp, California bound for Dallas, Texas and had been hearing about wind and dust storms ahead of us. 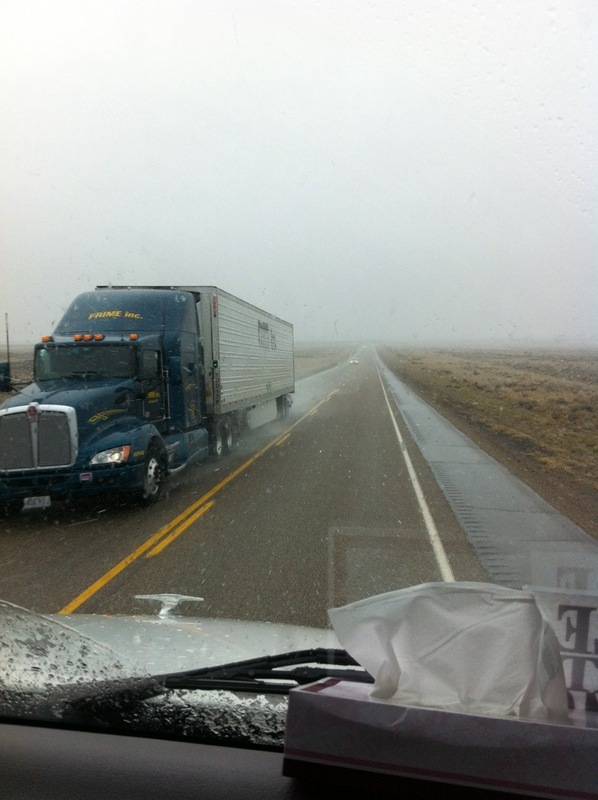 We had been fighting the gusts in California and Nevada. The winds eased up a bit entering Arizona but not by much. Looking at the Weather Channel app on my phone I saw “Severe Weather Alerts” for the Flagstaff area of strong winds gusting to 65 miles per hour. 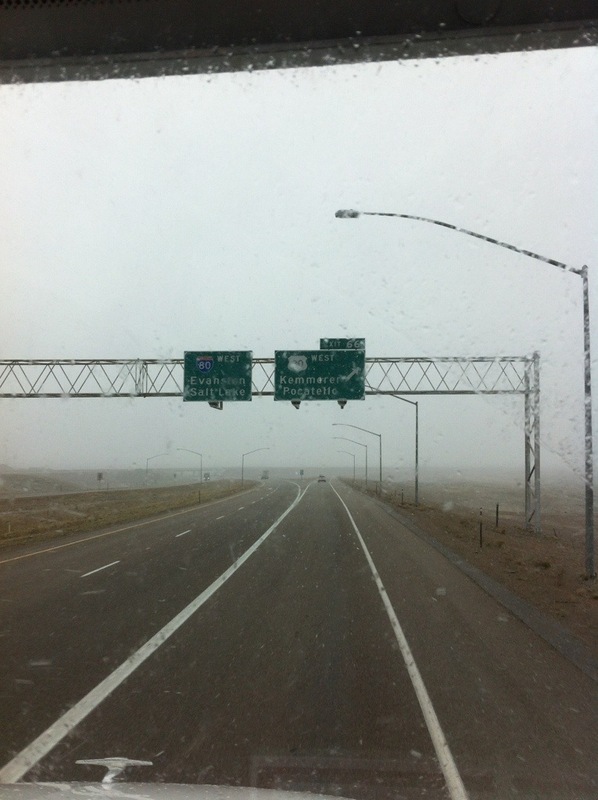 We later learned that 33 miles of I-40 were closed down in both directions from Twin Arrows, Arizona to Winslow, Arizona. 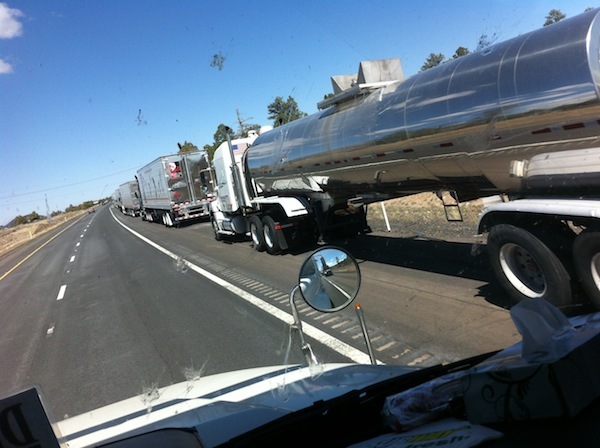 The drivers of these trucks, idling or shut down on the roadway, take this weather event seriously….as did the Highway Department of Arizona closing the roads. 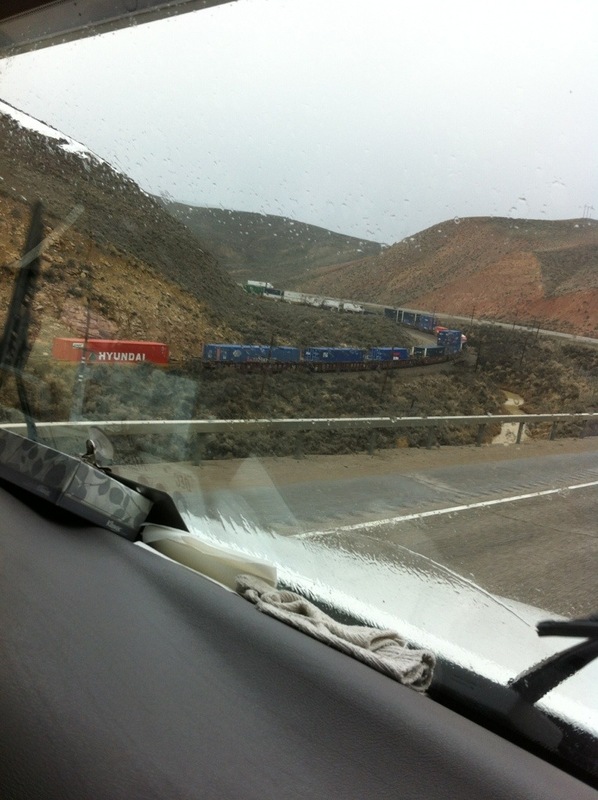 Straight line winds can blow semi trucks over. The empty trailers are more vulnerable to this because of the lack of weight and a broad surface for the winds to push against. Fully loaded trucks are not immune to being toppled either. Watch this video to see what happens to a truck in these high winds. 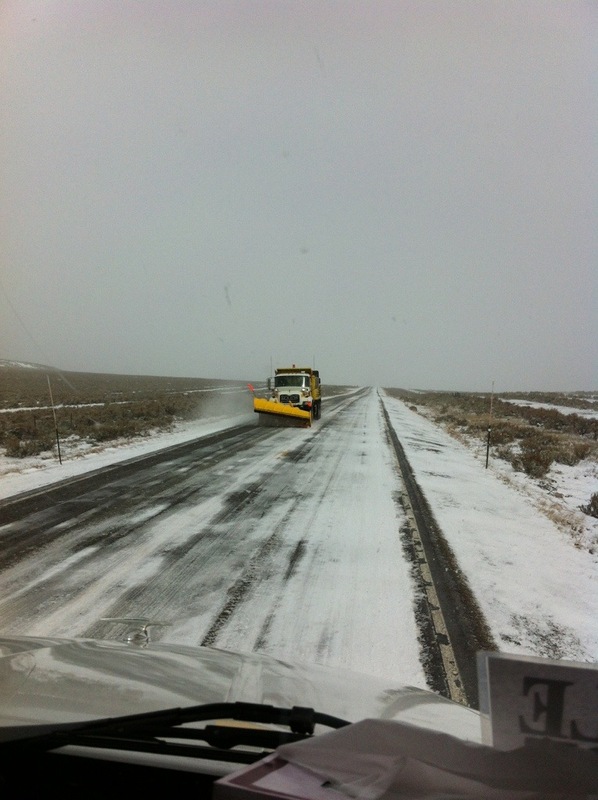 This is an old video and takes place in Nevada but the result is the same had the roads in Arizona been left open. The ramifications of this kind of an “accident” are many. First the driver will be cited, or ticketed, for unsafe driving because he/she did not find a place to wait out the weather. Second, the driver will be sent to the hospital by ambulance to have wounds and broken bones tended. Third, there will be two to three tow trucks brought to the accident site – after the winds die down – to right the truck and trailer. Each tow truck will have a minimum charge of $100 per hour and the clock starts ticking the minute the driver gets in the tow truck at the shop before getting to the accident site. Fourth, the roads will be shut down or traffic diverted while the tow trucks do their work in getting the truck and trailer upright. 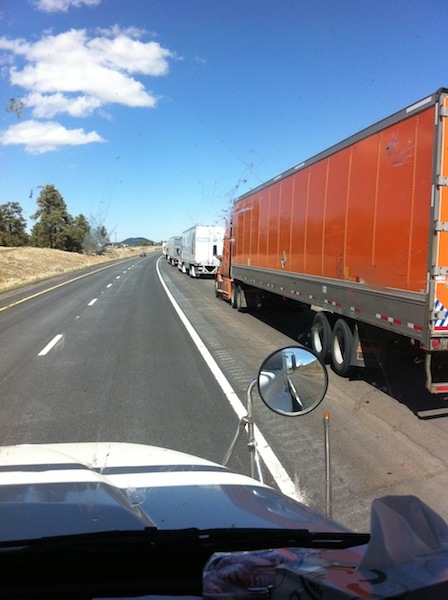 The state can send a bill to the trucking company for the amount of time the highway is blocked. Fifth, the truck and trailer will both be “totaled” by the insurance company. Frames bent, king pin and fifth wheels will have been stressed to a point of being unfit. Sixth, the driver will be unable to work until he/she gets back home to their “truck terminal” or where they are dispatched out of. 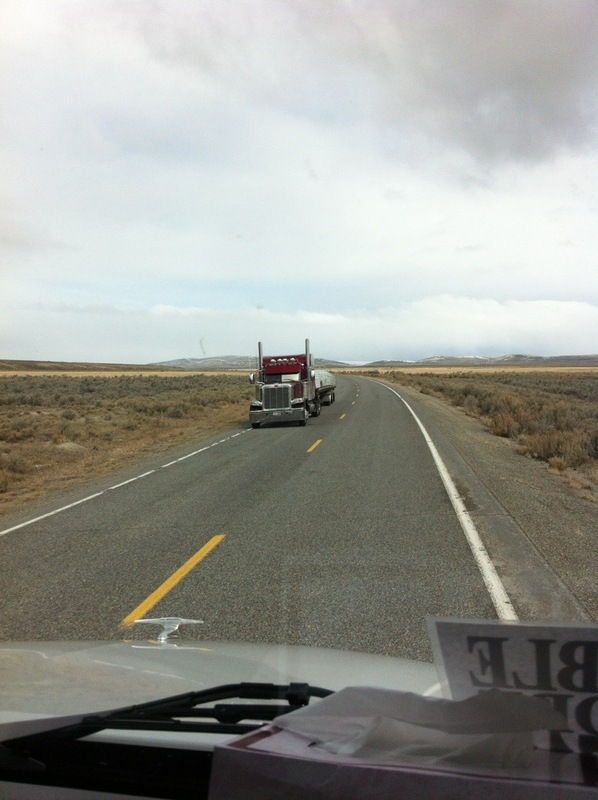 The final cost of an accident related to wind gusts can reach $500,000 if the truck and trailer are empty. The costs can go up into the millions of dollars if the trailer had been loaded with product and THAT brings on a different can of worms. Bringing another truck and trailer out to the site. Someone from the company will have to be flown out to look at the product and make decisions. That person will decide if the contents are salvageable or not. If not more equipment will be brought to the site. Forklifts, dump trucks, front end loaders to scoop the detritus into the beds of dump trucks. The costs add up quickly. There are some arrogant truck drivers that would fume at the delay and tell everyone that would stand still long enough how he would be able to drive through the winds with not a single problem. Other drivers would chafe at being delayed for seven hours or more and have to listen to the dispatchers chew their butts. For the drivers that waited alongside the road, they will get an earful at the delivery point for being late, they are caught between a rock and a hard place. Damned if they do and damned if they don’t. We had to listen to the stoney silence and the long exhalation of breath that came from our dispatch office over the delay. 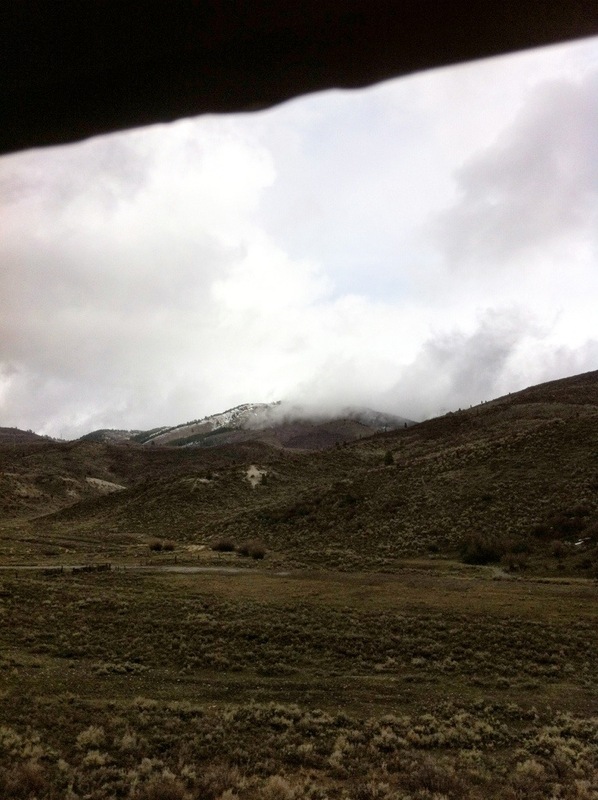 However we were calmly told to wait out the storm and hit the road early the following morning. This job allows a certain freedom unlike any office or factory job. The weather and “Mother Nature” have to remind us all who really has the upper hand in this life. 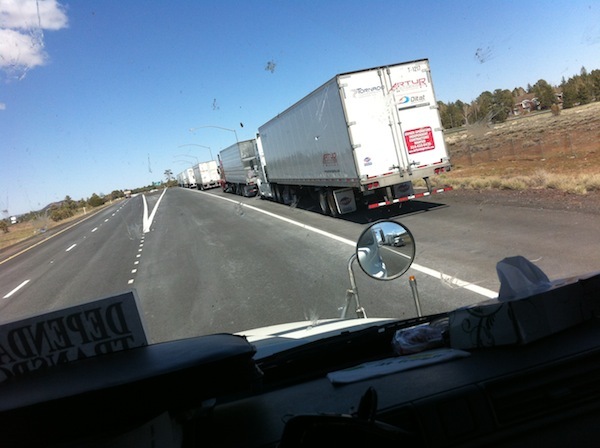 Long ago, when I first was introduced to the truck driving life, one of the mantras spoken over the CB radio to wish a fellow trucker good luck – much like telling an actor to “break a leg” – was “Keep the dirty side down and the shiny side up”. So to all you “Good buddies” out there stay safe and ever vigilant. 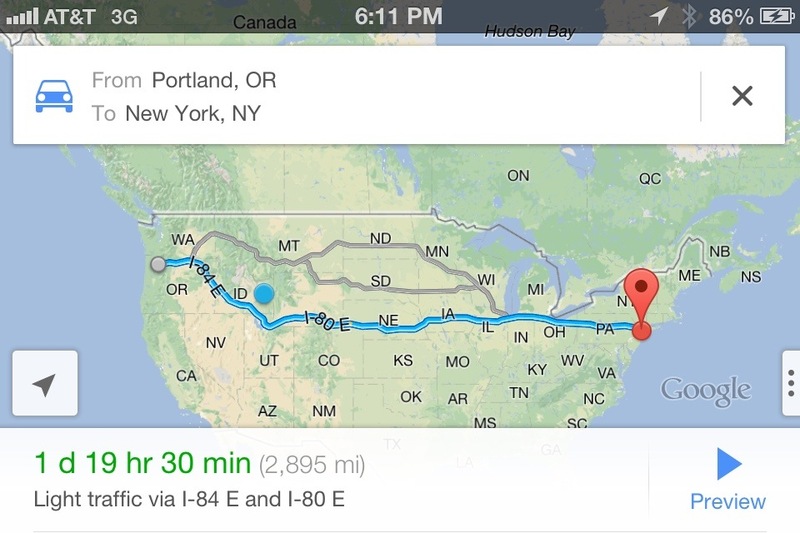 7,619 miles driven, so far, in April. We are home for a couple days before we get back out. This month has been a hard one for Joe and I with the demands of our work. We seem to be edging toward a “regular” truck driving job. 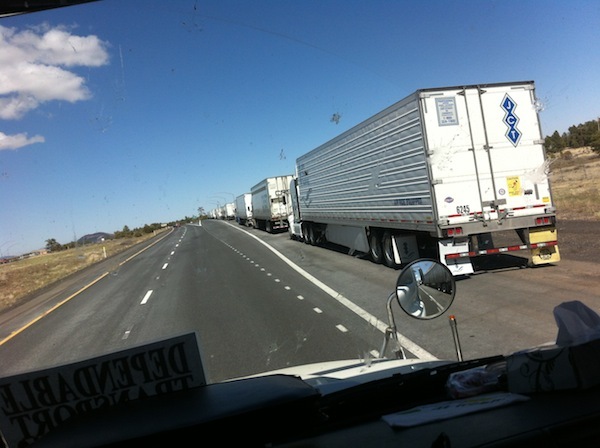 For those drivers working the “regular” job and logging 3,000 miles – plus – in a week I SALUTE YOU! There has been very little time in the day for me to check my fellow bloggers and see what they have contributed. I’m having trouble with my phone. It seems to turn the ringer off while in my purse so I have missed calls from friends and family. While I attempt to catch up on my blog reading and video watching (if I don’t fall asleep at my keyboard) I will leave you with a funny video. 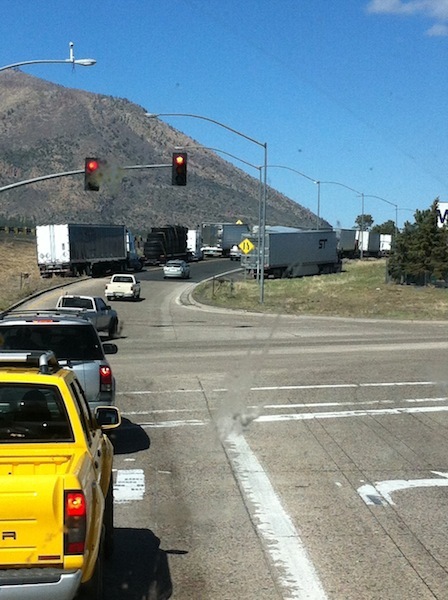 One major rule of truck driving is to know the height of your vehicle. 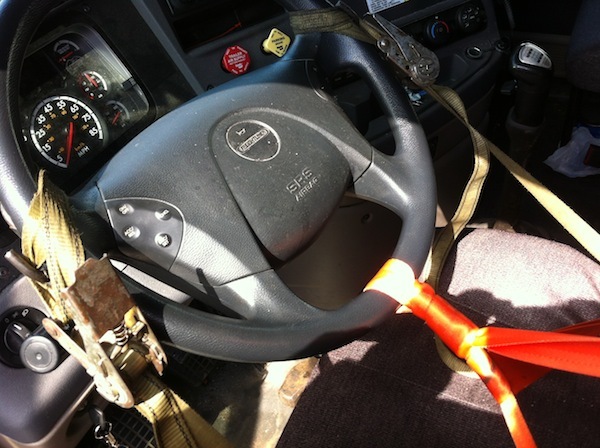 Disastrous results ensue if a driver doesn’t keep this one rule in mind. Hope you enjoy this video. It was sent to me earlier in the month and I finally watched it last week. 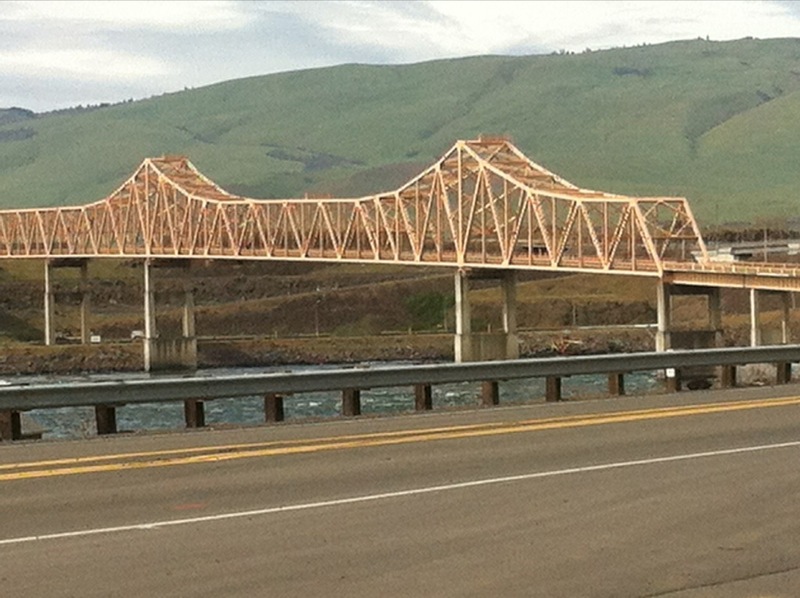 A pictorial view of bridges and barges on Oregon rivers. 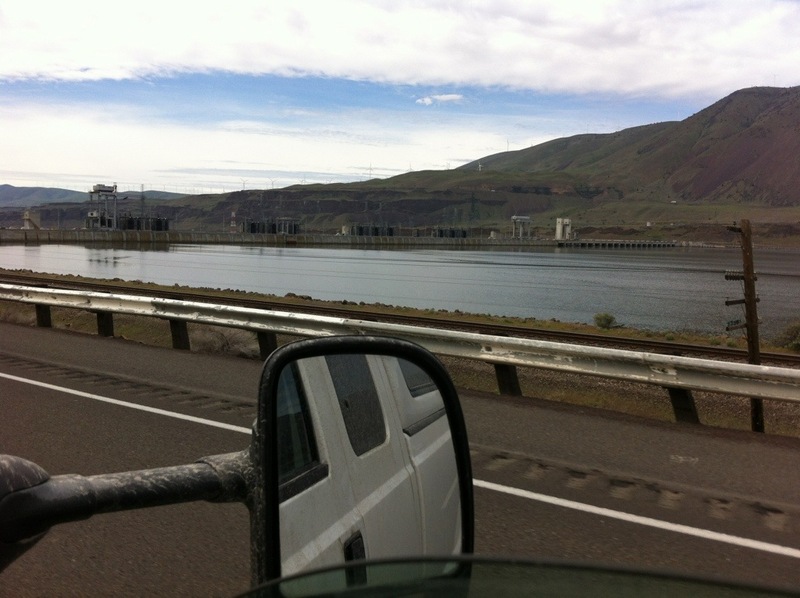 Following the Snake River along Interstate 5 in Oregon on our way to West Sacramento, California. Forgive me, I have no idea what the names of the bridges are. I just enjoyed looking at them. Idaho and Montana. Big sky country. This original post got lost in the ether somewhere. More likely it is because that post was liberally dosed with American History. A high school class I tended to nap through since it was dead boring. 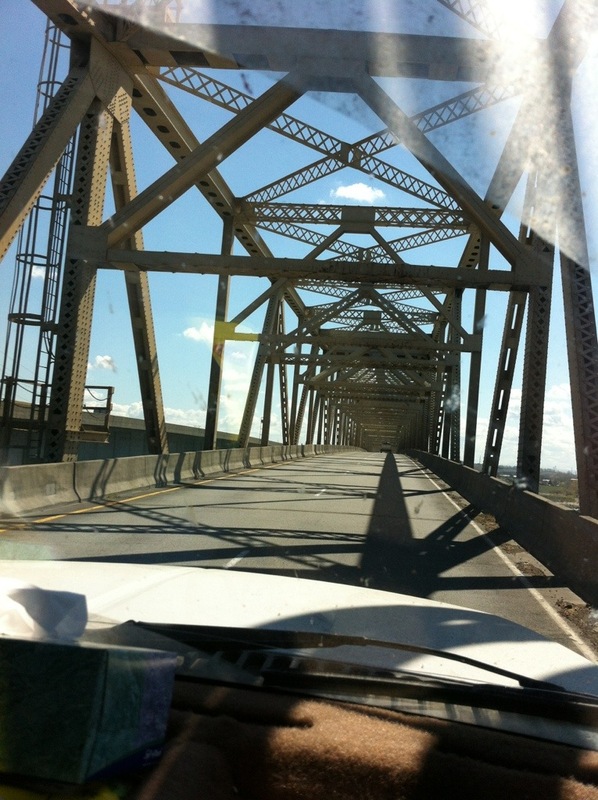 Much of the land mass we have traveled through on this journey delivering new trucks is rich in history, American history. 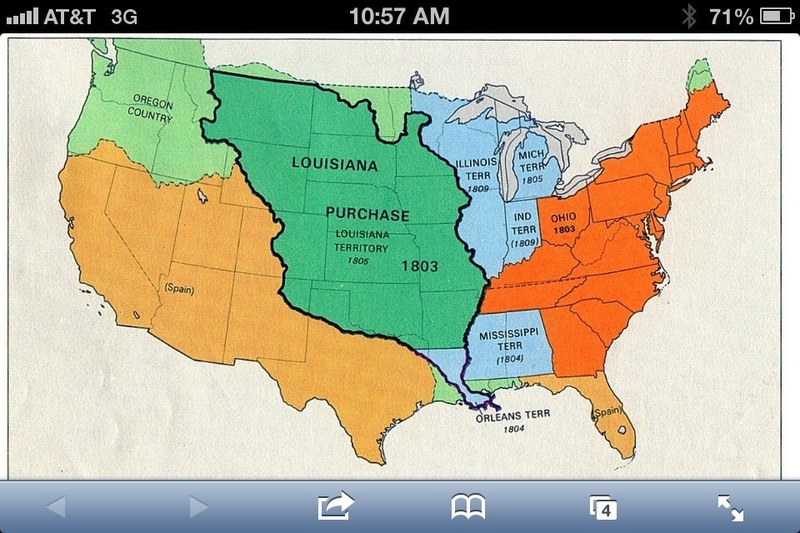 Starting with the fact this territory was, long ago, the “Louisiana Purchase“. Lands purchase from France. “Open Range” is still practiced in Montana. Most all other states have fence laws requiring the ranchers to maintain property boundaries, thus keeping their livestock on the rancher’s land. Some Montana farmers have 2,500 acre wheat fields that benefit from the cattle eating the stubby leavings after harvest plus the deposits made from the opposite end of the grazing cattle. The problems with Open Range have not become so unbearable that fences are slapped up all over the place. One problem is livestock wander all over the place following their nose for better grazing. Not just cattle either. 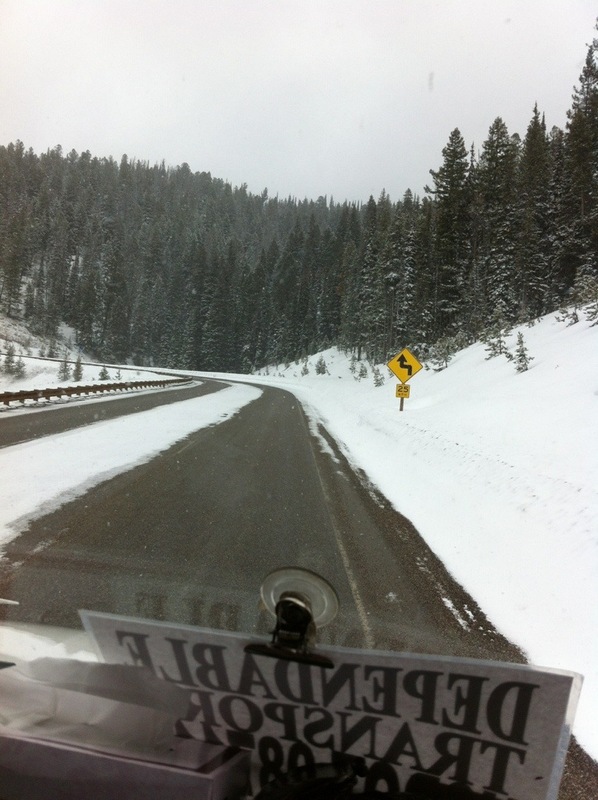 We came around a bend in the road on US 93 in Montana and got the fool surprised out of us. You hit a cow, horse, mule, or other livestock on open range roads be prepared to cough up a few thousand dollars – in addition to the cost of getting your vehicle fixed. 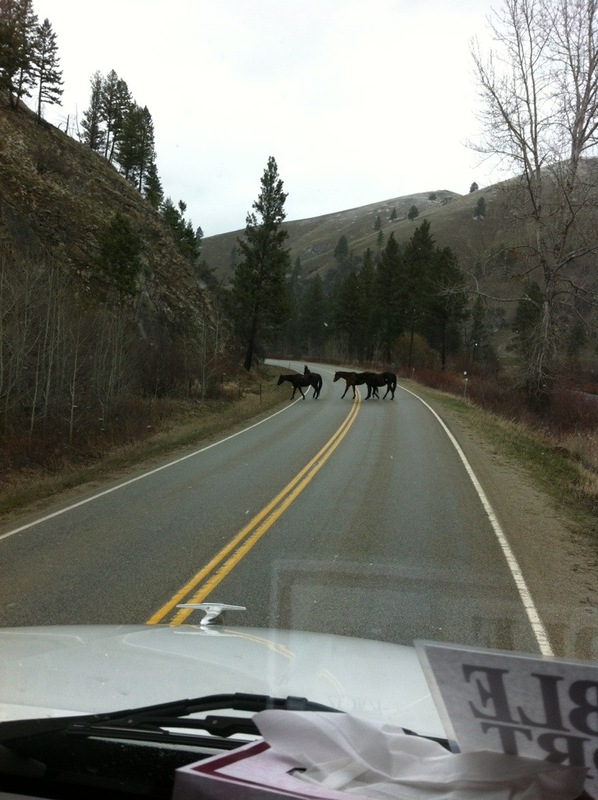 Open range ranchers are not responsible for your inattentive driving. Another problem with open range ranching is the enmity that can arise when one rancher has to pay a couple thousand dollars to drill a water well for his/her cattle then find cattle with some other ranch’s brand glugging away at the watering hole. One more problem of open range livestock is those guys can “walk a fer piece” and end up mingling with other brands or disappearing in the wilds somewhere. The man hours lost by the ranch worker searching for the cattle bearing the right brand. I can imagine it wouldn’t be too hard to rebrand a cow or calf and just keep that stray to line your own pocket. The vast open range is beautiful. 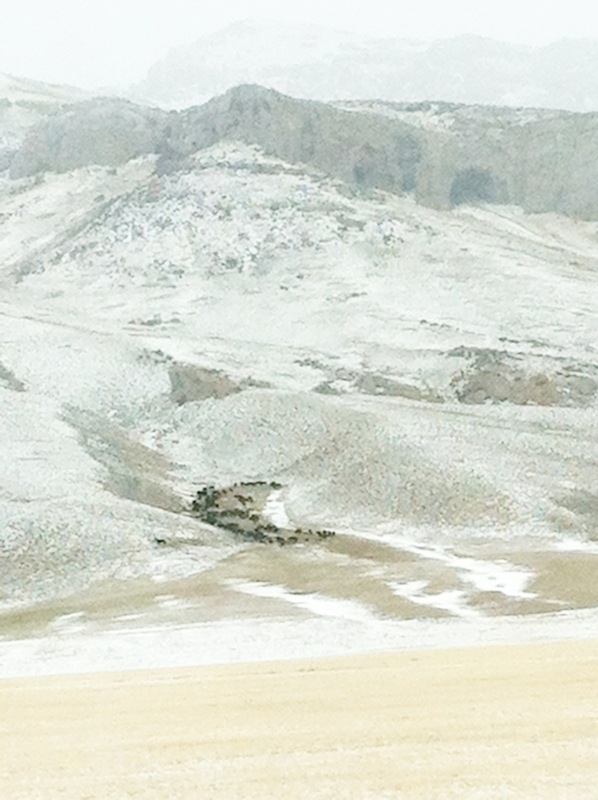 I saw cattle grouped together in a windbreak, of sorts, nestled in the bottom of a mountain range. Traveling Idaho 33 and Idaho 28 was a long and lonely road. 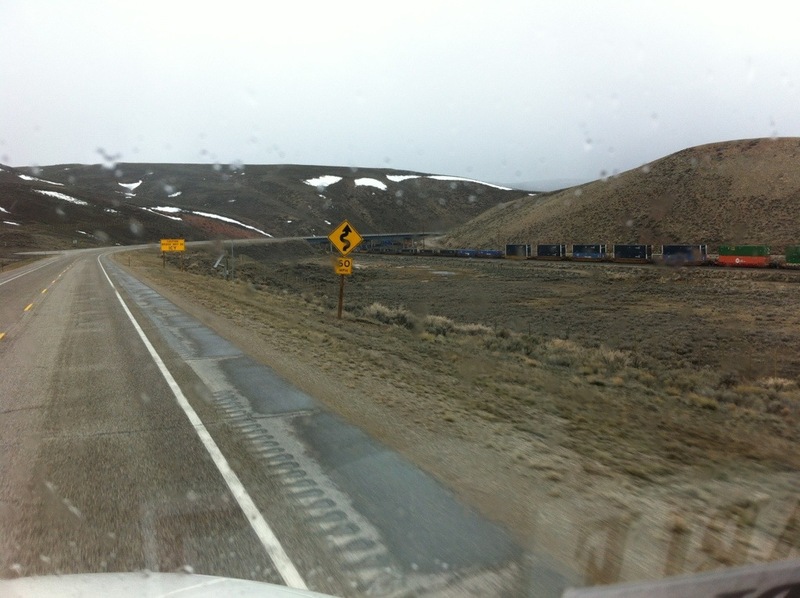 There were a total of six vehicles we met on the two lane road that stretched over 100 miles. The weather changed with the elevation. Rain. Rain mixed with snow, snow and ice, then warm and dry. An old dilapidated homestead watched our approach. I thought about the family that first built and lived in this house. There was, quite possibly, a two day ride required to visit, or seek help, from neighbors. I whispered prayers of thanksgiving that it was not I giving birth in that house long ago. Snow piled deep all around as far as one could see while the bitter winds howled trying to get inside. Getting a pair of sewing scissors to cut the umbilical cord from the new born babe. Thank God I had a hospital staffed with knowledgable people to see me through my birthing ordeals. Historical markets pepper all the roads we traveled. 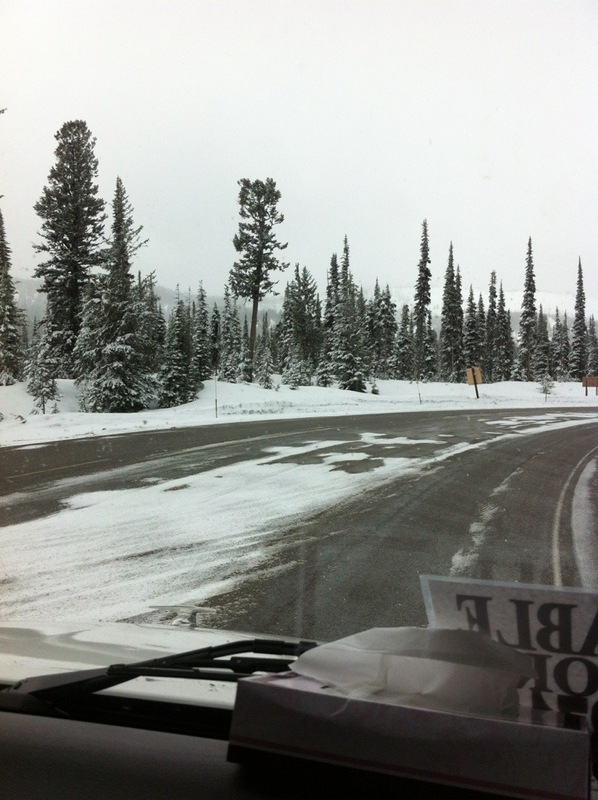 Idaho 33, Idaho 28, and US 93 in Montana. 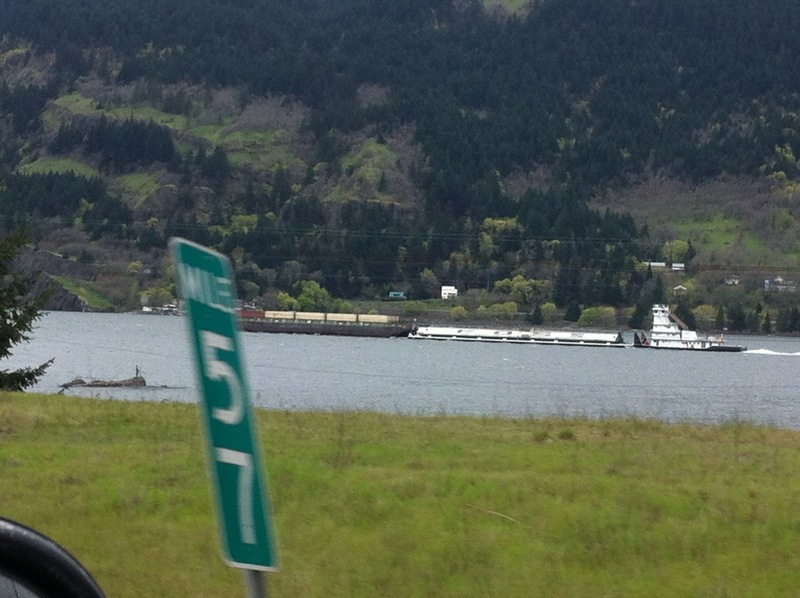 The Lewis and Clark Expedition spent time on these lands. They were aided by Sacajawea and her Nez Perce husband. 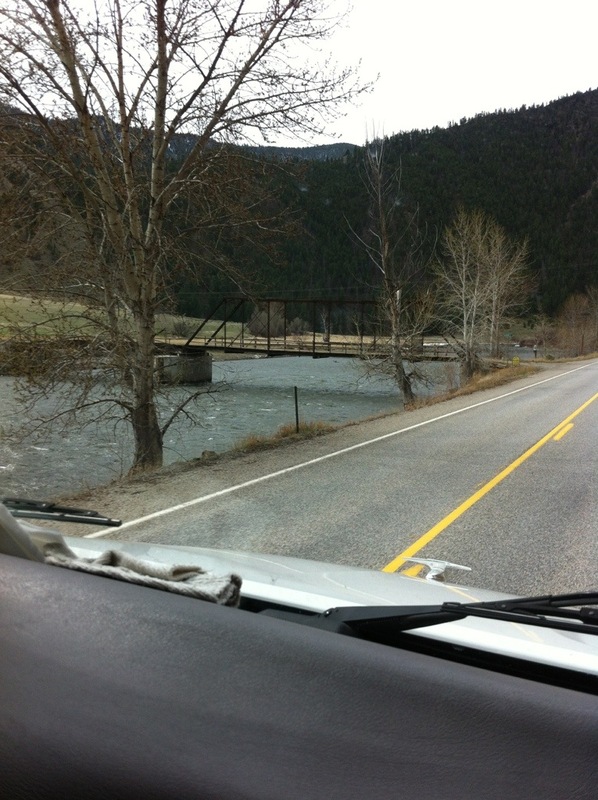 We went through the Bitterroot mountains. Twists, turns, frighteningly steep cliff edges, topped off with breathtaking scenery. While I was bored stiff in my high school history class I never once thought I would one day be deep in the nearly hallowed grounds of the ancients. Hope you have enjoyed this seriously condensed version of some American history. 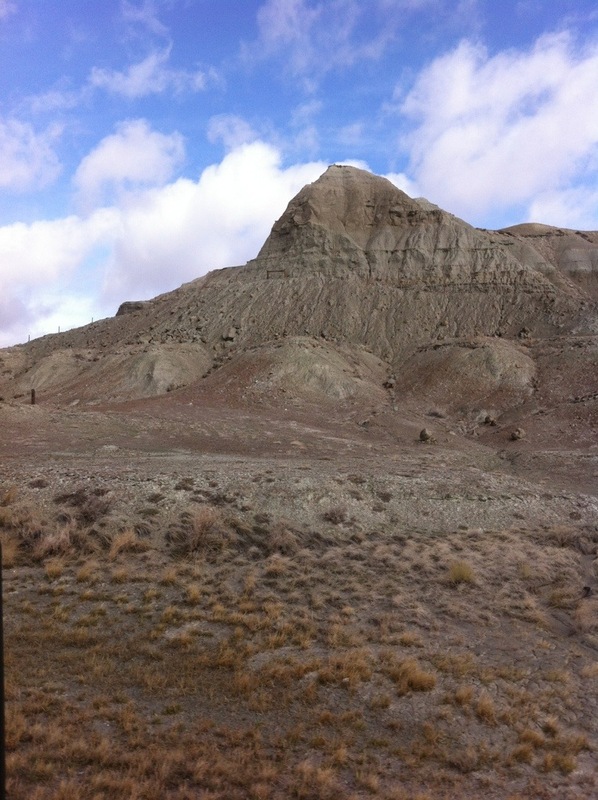 In the footsteps of rugged pioneers – sort of. 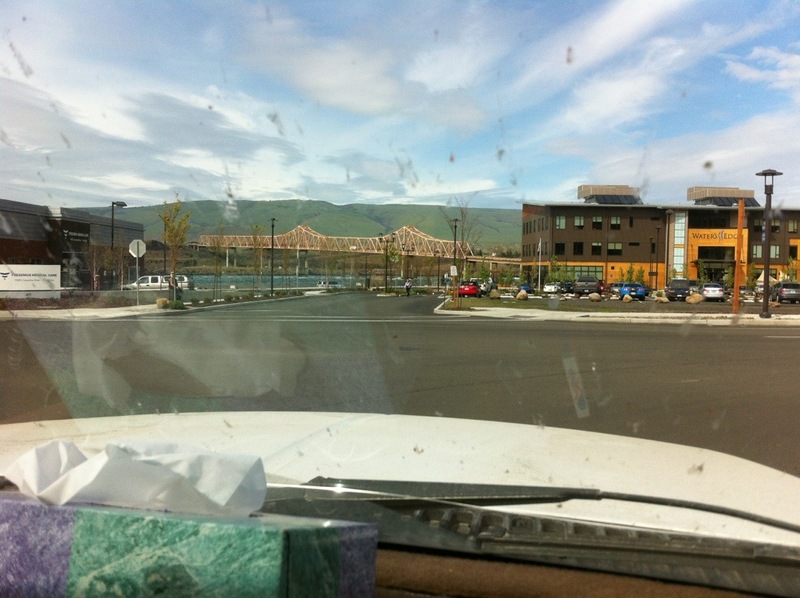 For over 12 years I have driven, or rode, across I-80. A bit of Missouri, Nebraska, Wyoming, and Utah going west. 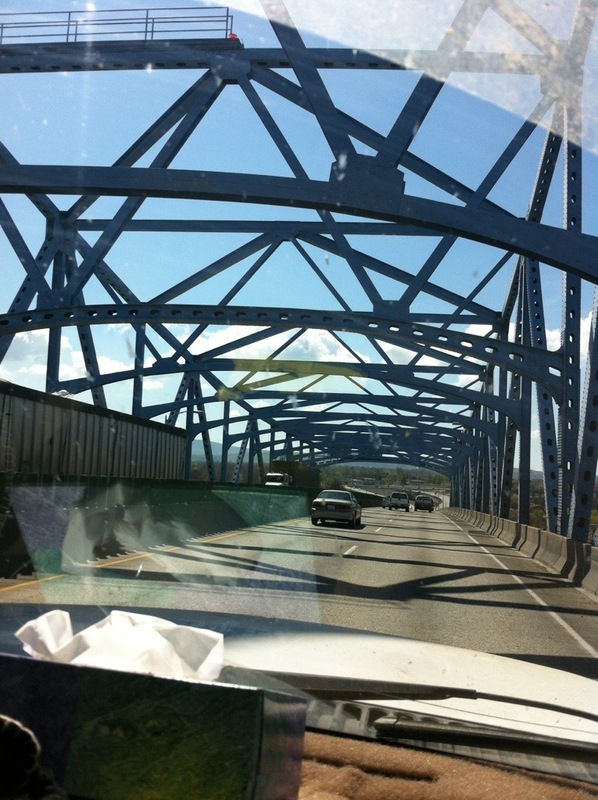 Going east on I-80 I have traveled through Iowa, Illinois, Ohio, Pennsylvania, Maryland, and New York. Before I get totally lost in this post I want to recommend a series of books – historical novels – by Dana Fuller Ross. Independence! Is the first of the series and set in 1837 during a land rush to claim the western lands by American settlers in a race to lay claim to the land before England or Russia take ownership. At that time, in American history, most of the population lived in the New England Colonies. People were piled up on each other. President Andrew Jackson opened the west to anyone that wanted wide open spaces, had the fortitude to settle and improve the land they chose, and wanted out of the confines of the east. Thousands of men, women, and children started their journey across country to a better way of life. Many didn’t make it. 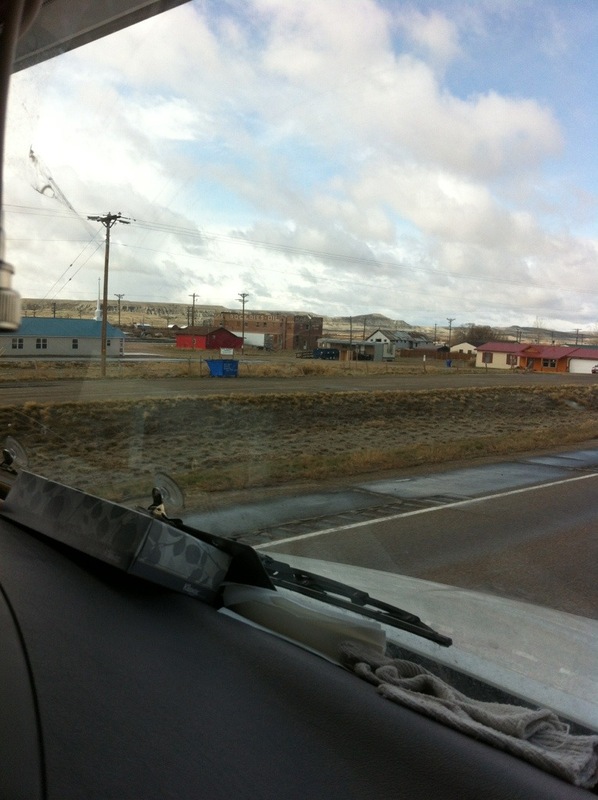 In Guernsey, Wyoming there still remains evidence of this westward move. Joe tells me there is a cave where the immigrants left messages carved into the walls. Register Cliff is the name of this historical site. Somewhere around 18 or 20 years ago I read the “Wagons West” series and I was reminded of it today as we made our way up US 30 leaving I-80 in Wyoming. On US 30 in Kemmerer, Wyoming stands the very first JC Penny store from 1904. 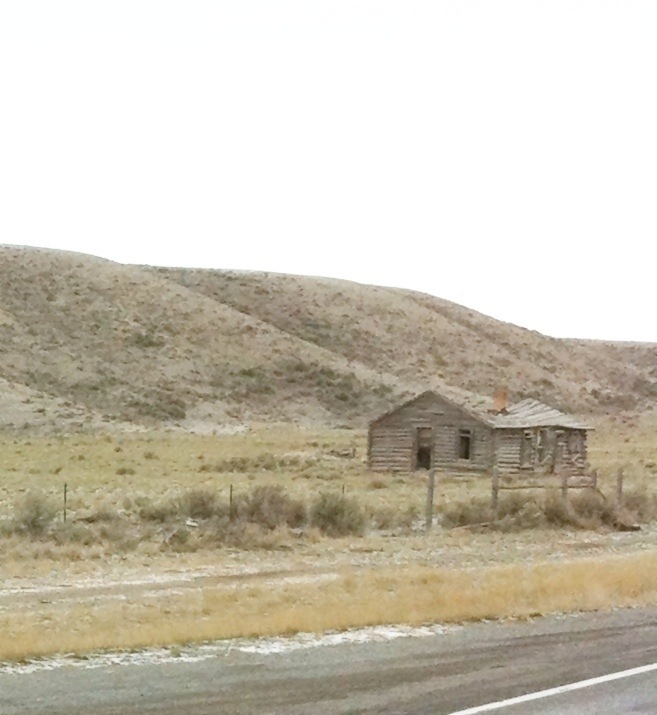 It was known as the “Golden Rule” store that served the mining families and ranchers out in the back of beyond Wyoming. The store has been turned into quite an amazing museum which also sells goods to tourists. It is worth stopping to see if you find yourself in the back of beyond. 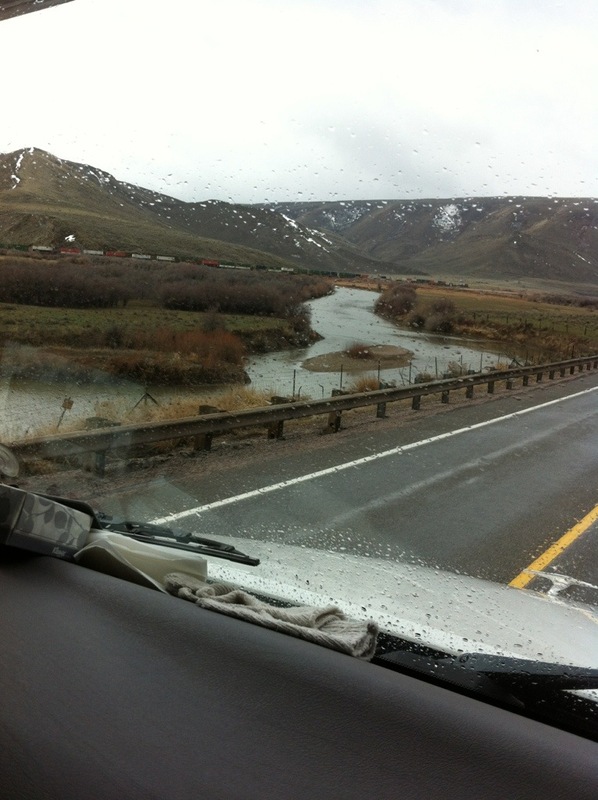 US 30 is a two-lane road used by the trucking industry, as well as normal traffic, to get into Idaho for livestock and produce which makes its way to your table. The landscape will not keep a teen interested for long. 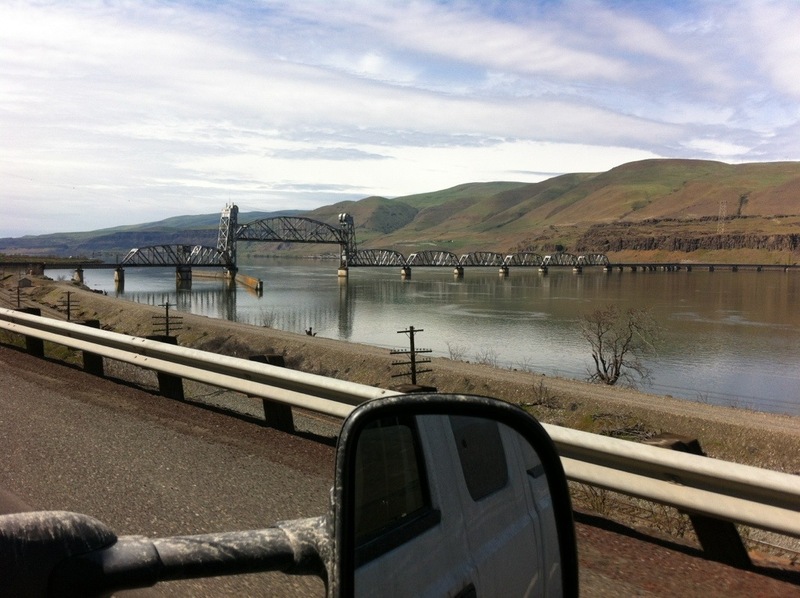 It is nearly 200 miles of dirt, scrub, rocks, an occasional town with a population of 96 souls, trains curving along the rivers and streams, and the highway. 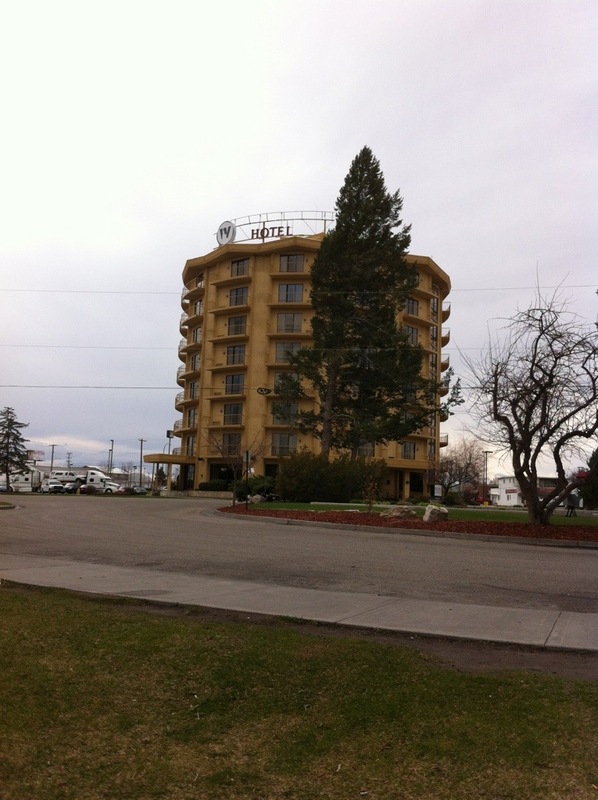 Montpelier, Idaho is located on the historical Oregon Trail and has erected a learning center in this small town. Click the Montpelier link above to be taken to the website and watch the movie they have. Seeing the Oregon/California center in Montpelier brought those books I spent hours and days reading – Wagons West. Which then jumbled everything I wanted to write about today. All the ideas were stepping all over each other. Maybe I have kept it all together and have a coherent post. I won’t bet money on it though. 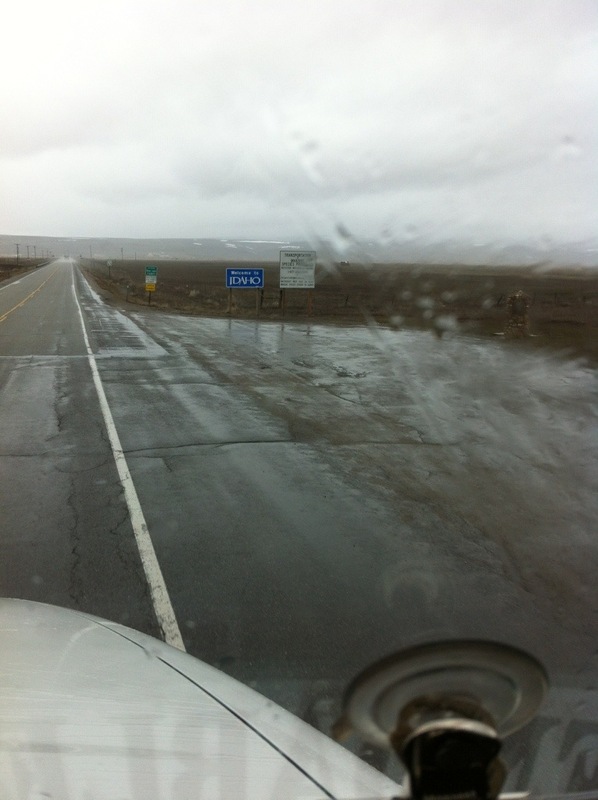 US 30 into Idaho continues on as a two-lane road. Rivers and streams cut through the pastures and mountains. Hills shrouded in low lying clouds made it look like they were on fire. 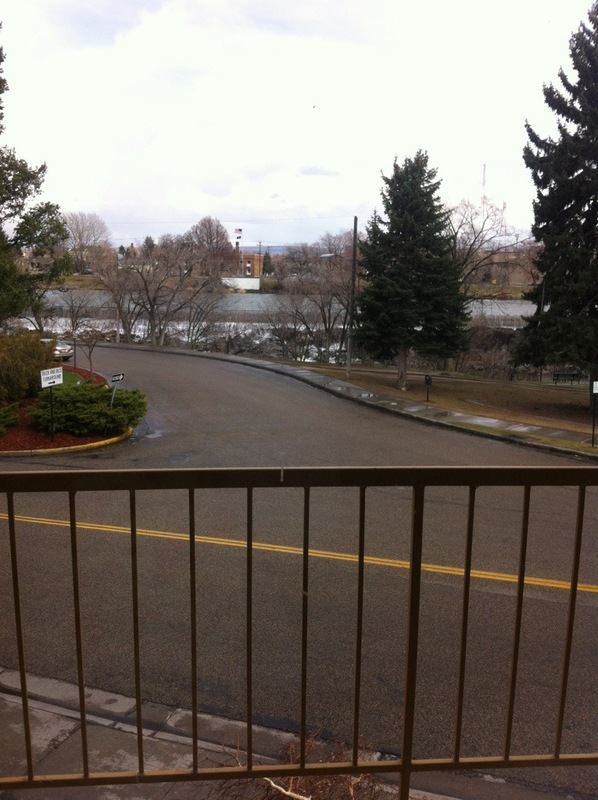 Before I make this post into a tome I will leave you with the sight outside my hotel room window. 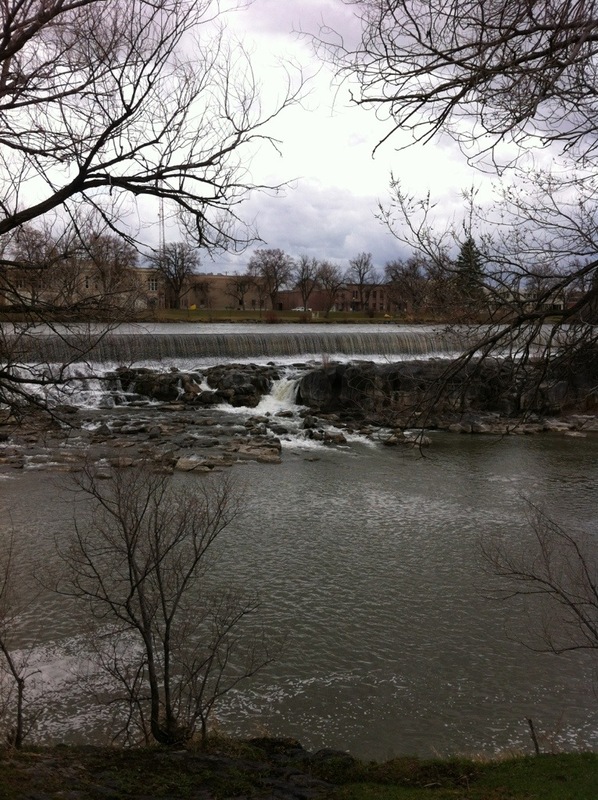 Idaho Falls on the Snake River in – Idaho Falls, Idaho. 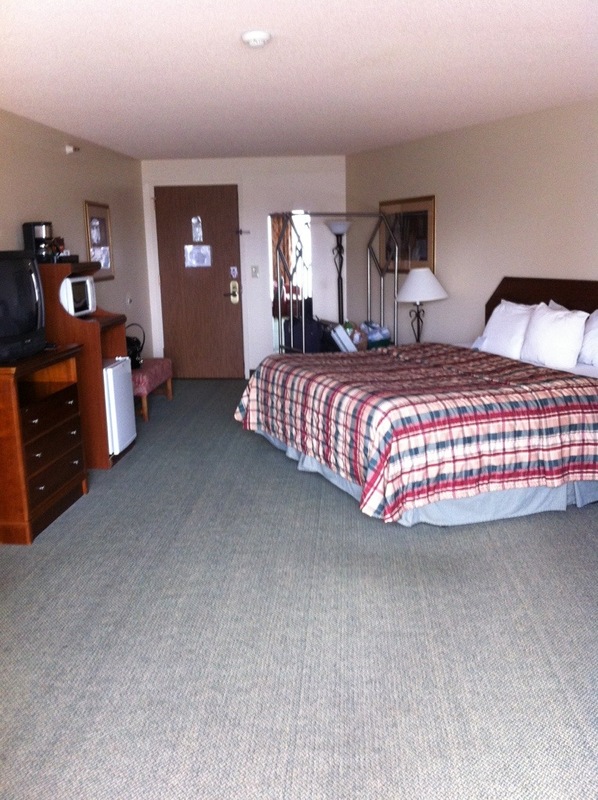 We are staying in a 40 year old hotel with a fantastic view. 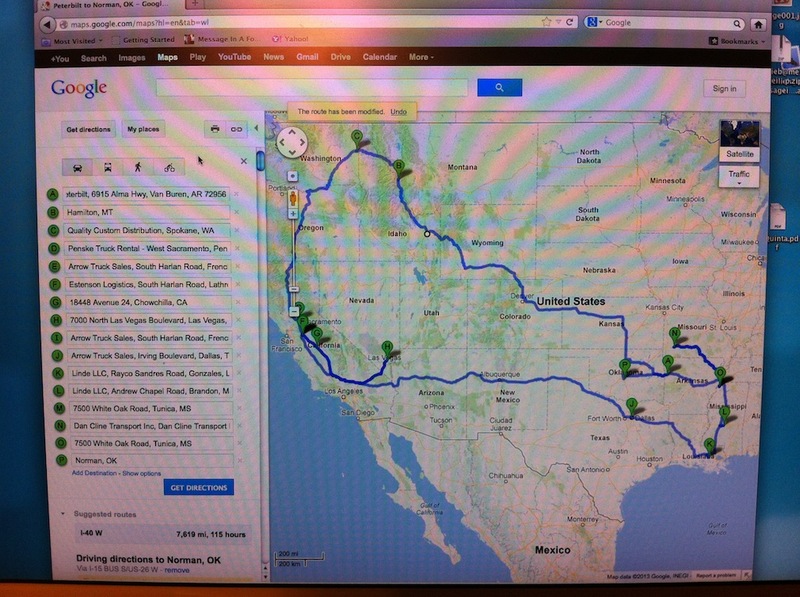 Tomorrow we will continue through Idaho then enter Montana, switch back into Idaho before entering Washington. Hope this has given you a spark for a summer vacation with your family. Or just entertained you for a few minutes.